A bent bike and a STUCK bottom bracket. Maybe you should leave the bike and come back tomorrow. Maybe I can’t do it while you wait because I still have 3 tune-ups to finish before close. Or maybe I know I’m going to have to do something to your bike that you don’t want to see me doing. If you think of your bike as your best friend, your must trusted companion, well he’s really f***** up and I’m going to put my foot in the small of his back and reset his shoulder with no anesthesia…..I don’t think you want to be there in the room when I do it. This bottom bracket was so stuck that I couldn’t budge it even while hauling on the wrench with a cheater bar. So I pulled the bike out of the stand so I could stand on the cheater bar. If this amount of force is necessary, this method is actually a very controllable way to apply it. Keep in mind that my splined BB tool has a bolt and threaded washer to keep it from slipping off the cup or buggering the splines, and the flooring is old rug over plywood. When the BB breaks free, the swing of the wrench stops when the cheater bar hits the floor. It’s so easy to come a cropper when two people are pulling opposite directions at frame and wrench with the bike in a workstand, but put the bike on the ground and you let gravity do most of the work. The frame/fork is unlikely to be damaged at the contact points with that floor, and the alignment isn’t going to be disturbed. Even if warping the alignment was a risk, in this case it totally doesn’t matter: the bike was bent from a collision and the bottom bracket had to come out so that the bike could be placed on the alignment table. 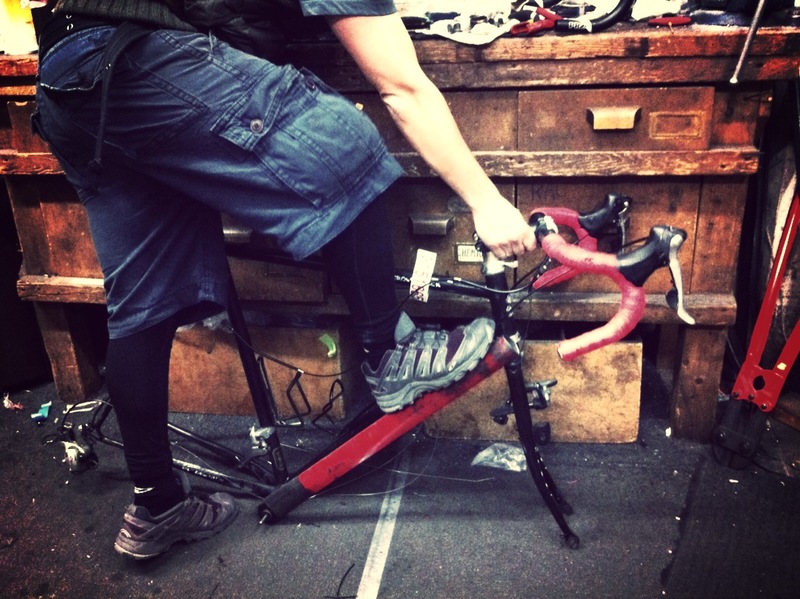 Under these conditions, bike mechanics is a no-holds-barred event.